We’d love your help. Let us know what’s wrong with this preview of Comeback by Paul Ingrassia. In Comeback, Pulitzer Prize-winners Paul Ingrassia and Joseph B. White take us to the boardrooms, the executive offices, and the shop floors of the auto business to reconstruct, in riveting detail, how America's premier industry stumbled, fell, and picked itself up again. The story begins in 1982, when Honda started building cars in Marysville, Ohio, and the entire U.S. ca In Comeback, Pulitzer Prize-winners Paul Ingrassia and Joseph B. White take us to the boardrooms, the executive offices, and the shop floors of the auto business to reconstruct, in riveting detail, how America's premier industry stumbled, fell, and picked itself up again. The story begins in 1982, when Honda started building cars in Marysville, Ohio, and the entire U.S. car industry seemed to be on the brink of extinction. It ends just over a decade later, with a remarkable turn of the tables, as Japan's car industry falters and America's Big Three emerge as formidable global competitors. To ask other readers questions about Comeback, please sign up. An oldie, but goodie, if you're into cars or business, especially the car business. How Detroit lost its way (the first time) and allowe Japan to eat their lunch. I would love it if the authors wrote a similar book about the years 2000-2010, when Detroit lost its way the second time. They made all the same mistakes they made the first time, in my opinion. That just goes to prove that there is no shortage of idiots, and people don't learn from history. Why wasn't this book required reading for any An oldie, but goodie, if you're into cars or business, especially the car business. Fantastic history of Detroit's Big History from 1980-95. The best of this genre is David Halberstam's "The Reckoning"; this book more than holds its own as a follow-up. I would have handed out five stars, but some of the anecdotes (there are several good ones) are repeated, and there is a chapter about a Spanish auto executive that doesn't fit the structure of the rest of the book. 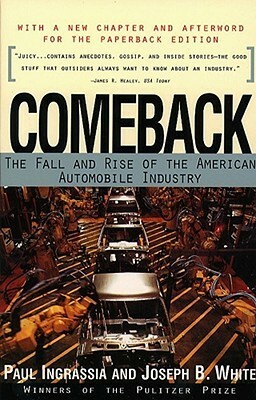 I read this book based on the last collaspe of the US car builders. Turns out the story never really ends. Sincew most people in the US now work in the service industry they have no idea of the pressure faced by manufactures using assembly line methods. You just can not stop building, even when things are not good.